On many locking mechanisms it is possible to change just the centre gearbox rather than the whole strip, and as they are fixed on by a couple of bolts its a relatively straightforward job to do. We have gearboxes available to replace GU, Era, Saracen, Mila, Cego, Surelock, Fuhr, Yale, Fullex and Maco. 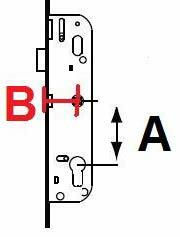 When identifying a gearbox for a upvc door the first measurements to take are the Centre (often called pz), and the backset. Measurement A is the Centre.This is the distance between the centre of the barrel and the center of the spindle. Measurement B is the back set. That is the distance from the front of the locking system to the middle of the spindle.The most common are 28mm and 35mm. There are some other sizes on older door sections. Look to see if there is a manufacturers name stamped anywhere on the strip.